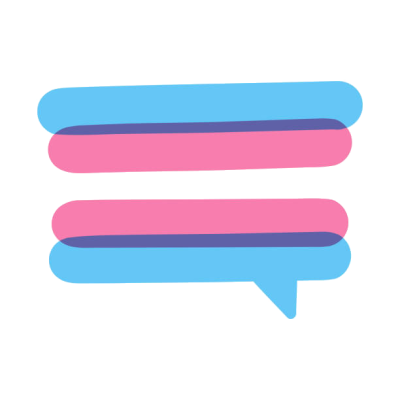 ​Many are unfamiliar with the needs of transgender students, and attempts to meet those needs can be fraught with emotion for all involved. Educators may have concerns about their own capacity to support their transgender students, or hesitate to act because of personal feelings or fear of negative reactions from the larger community. Transgender students themselves may struggle with a variety of issues in seeking to be authentically seen, including the fear of social rejection and mistreatment or abuse from peers. As a result, many of these students hope to escape notice and to simply survive rather than flourish. 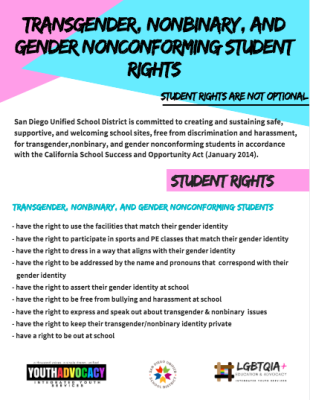 LEARN MORE ABOUT TRANS IDENTITIES AND HOW TO BEST SUPPORT OUR TRANS STUDENTS & COMMUNITY. Our gender identity is how we see ourselves. Some of us see ourselves as women, some as men, some as a combination of both, some as neither. Some of us have complex identities that may even be fluid and change over time. For instance, some of us see ourselves as female to male trans people who also identify as butch women and genderqueer and some days as drag queens. Everyone has a gender identity. And, everyone expresses their gender identity. We all make choices about how to cut or not cut the hair on our head, the hair on our legs, what clothes to wear, whether or not and what type of make-up to wear, what body parts to accentuate or not, etc, etc. We all make hundreds of conscious decisions every day about how we are going to express our gender. We all have a gender identity. Transgender people (very broadly conceived) are those of us whose gender identity and/or expression does not or is perceived to not match stereotypical gender norms associated with our assigned gender at birth. free from discrimination and harassment, for all students. handle on the other struggles in your life. TGNC youth have a high rate of homelessness because many can’t rely on parental support—whether financial or emotional. Not to mention that mistreatment at school is so common that many drop out. over the country, and they deserve to be treated with respect and fairness. movement, and momentum is building. Our voices can be heard everywhere. developed by examining school district policies from various states, drawing from guidance provided by states and the federal government, and identifying best practices for a national context. -"Dear Trans Students, from a Trans Educator #HUMANIZE ME"
-"What Does it Mean to Be Genderfluid?" -Separation and Stigma: Transgender Youth and School Facilities"
As part of a series of editorials about transgender experiences, we are featuring personal stories that reflect the strength, diversity and challenges of the community. Welcome to this evolving collection. or a girl, and expected to identify a certain way based on what’s between your legs. going to dive into during this series, being trans, gender identity, and what its all about.